As we near the end of the year, global markets are on a high despite China, Korea, Brexit, Trump, Italy and Fed rate concerns, among others. US 10yr yield is at levels they were not supposed to reach until the end of 2017, reflation trade is in play and OPEC has finally agreed to production cuts. Not many would have seen that coming. For shipping it was another tough year. As 2016 (the most tumultuous and dreadful year for the global maritime industry in recent history) comes to a close, we at Drewry Financial Research Services Ltd. release The Maritime Honours List 2016, which comprises the best performing maritime equities under our coverage universe (yes, there were a few with outsized returns despite the odds).The list throws up some surprising names, such as the ones that are back from the verge of bankruptcy to be placed in our leader board. The steady performers of recent years have slid a few notches and the outliers have performed. The clear favourites at the start of the year have gone into hiding and the underdogs have bounced back sharply. Overall industry returns have been uninspiring with majority losing money for their investors. 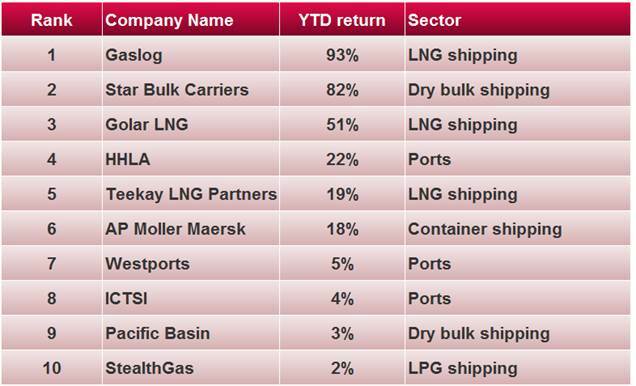 • Gaslog Ltd (GLOG US), one of our top picks in the gas shipping space was the clear winner with 90% returns in 2016. The company had a stellar run since the beginning of the year as investors took advantage of the low valuations amid stabilising oil markets. The high charter cover and receding concerns over debt repayment gave investors the much-needed confidence. • Star Bulk Carriers (SBLK US) was the second best performer under our coverage – being the prime beneficiary of our “normalisation thesis” in the dry bulk market. The stock price raced ahead as the bankruptcy risks that were priced in early 2016 faded and the company’s success in raising capital as well as its debt moratorium soothed investors’ nerves. • Golar LNG ( GLNG US) took the 3rd position, rebounding from multi-year lows. GLNG benefitted from improvement in oil markets and progress made towards completing the company’s first FLNG vessel. The return of volatility and buying the drawdowns. 2016 was dominated by high volatility in stock price movements. The top names on our leader board also spearheaded the drawdown charts with huge pullbacks from their yearly lows. Buying the quality names such as Gaslog, A P Moller Maersk and Pacific Basin in severe market drawdowns indeed proved to be a very rewarding strategy. Few stocks rebounded strongly after multi-year downward trends potentially signalling a trend reversal. Dry bulk shipping – Back from the dead. Benchmark BDI touched a record low this year – just 291 points above the nadir. The sector that exemplifies what’s wrong with the shipping industry has seen massive wealth destruction in recent years converting many stocks into worthless investments. In a year that can be marked by reverse-splits, equity raising and debt restructuring, the dry bulk shipping stocks staged a massive rebound but remain well below their recent 2-3 year peaks. Tanker Shipping – Honey, who shrunk my dividends. Tanker shipping is a play on cash flow and dividend expectations. The stock slid to newer lows and investors did not buy into high implied yields in early 2016. Falling dividends and expected decline in earnings on account of a surge in vessel deliveries and plateauing oil imports weighed on the stock prices, and they ended 2016 on a whimper. Container shipping – Live and Let Live no more. The Hanjin bankruptcy was a wake-up call for the workhorse industry of the global trade. Amid the immensely challenging environment, in a true test of survival, industry embarked on the much-needed course correction. Some green shoots are visible but much is to accomplished for sustained profitability. LNG shipping – Investors cherry pick. LNG shipping stocks were on investors’ radar in 2016 as they were available at attractive valuations after the deep cuts seen in 2015. Further, as the risk of lower oil prices subsided, companies with earnings visibility saw value buying through the yea to top our Leaderboard. 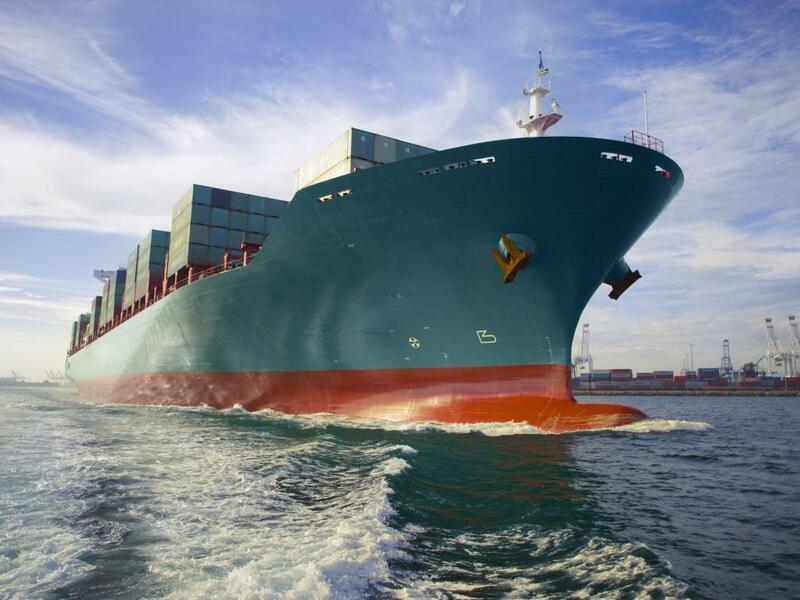 LPG shipping – The delivery deluge. Freight rates for LPG ships fell off the cliff as oversupply in the segment took centre stage coupled with declining arbitrage trading opportunities. The carnage in VLGCs trickled down to the smaller segments worsening the performance of LPG stocks in 2016. . Port operators – Compression in play. With declining organic profitability and structural changes in the container shipping sector, there was a clear downshift in port valuations playing out in 2016. The year was marked with flattish price performance driven by compression in growth and price earnings multiples. We have no doubt 2017 will be no different with volatility set to rule as the reset progresses. Investors continue to shun maritime stocks with their interest still bordering on a mix of scepticism and pessimism. We look forward to The Maritime Honours List 2017 to see if tanker stocks regain their lost glory, dry bulk goes back in the dumps or containers march ahead.